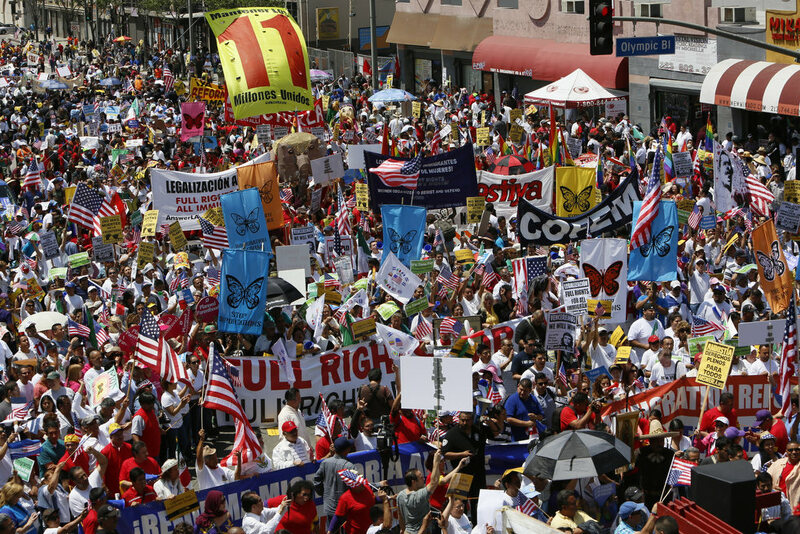 (Left) Union members, immigrants, and many others participate in the May Day march and rally in Los Angeles in 2013. 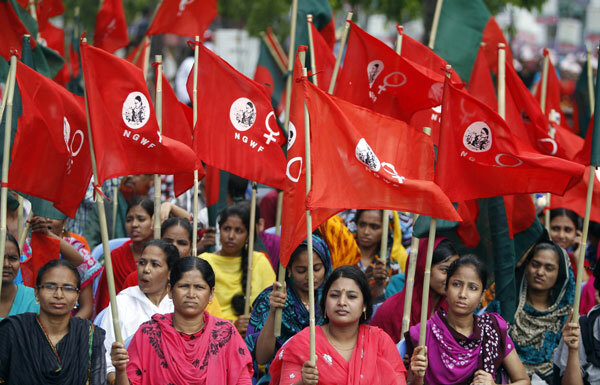 (Right) Garment workers and activists participate in a May Day rally in Dhaka, Bangladesh last year. Unlike the rest of the world's democracies, the United States doesn't use the metric system, doesn't require employers to provide workers with paid vacations, hasn't abolished the death penalty and doesn't celebrate May Day as an official national holiday. 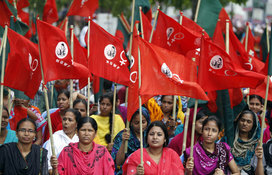 But outside the U.S., May 1 is international workers' day, observed with speeches, rallies and demonstrations. This year, millions of workers in Europe, Asia and Latin America will be taking to the streets to demand higher wages, better benefits and improved working conditions. In Bangladesh, for example, protestors will be in the streets to demand that global companies like Walmart improve safety standards in local sweatshops, which have become death traps. In San Francisco and Oakland, the local chapter of the International Longshore and Warehouse Union has vowed to shut down the two ports next Friday, May 1, to protest police brutality. In a statement, the union said, "It is fitting that on May Day, International Workers Day, Bay Area ports will be shut down to protest the racist police killing of mainly black and brown people." In 2008, the same union chapter shut down Pacific Coast ports to demand an end to the wars in Iraq and Afghanistan. This year, May Day arrives amid a growing protest movement against police abuses in cities around the country. Not surprisingly, many May Day rallies will focus attention on this issue to link demands for civil rights, immigrants' rights, and workers' rights. The Los Angeles County Federation of Labor is sponsoring a May Day rally at Dragon's Gate in Chinatown, calling for a $15 an hour wage, justice in communities of color, and no more delays for DACA/DAPA (Deferred Action for Childhood Arrivals and Deferred Action for Parents of Americans and Lawful Permanent Residents). Ironically, the May Day celebration of working-class solidarity was started by the U.S. labor movement and soon spread around the world, but it has never earned official recognition in this country. Progressives around the country, working on a variety of issues, have embraced the new May Day movement. It isn't just about workers rights on the job, or immigrant rights, or civil rights, or even about raising the standard of living for all workers. It's about what kind of country we want to be. The original May Day was born of the movement for an eight-hour workday. After the Civil War, unregulated capitalism ran rampant in America. It was the Gilded Age, a time of merger mania, increasing concentration of wealth and growing political influence by corporate power brokers known as Robber Barons. New technologies made possible new industries, which generated great riches for the fortunate few, but at the expense of workers, many of them immigrants, who worked long hours, under dangerous conditions, for little pay. As the gap between the rich and other Americans widened dramatically, workers began to resist in a variety of ways. The first major wave of labor unions pushed employers to limit the workday to 10, then eight, hours. The 1877 strike by tens of thousands of railroad, factory and mine workers -- which shut down the nation's major industries and was brutally suppressed by the corporations and their friends in government -- was the first of many mass actions to demand living wages and humane working conditions. By 1884, the campaign had gained enough momentum that the predecessor to the American Federation of Labor adopted a resolution at its annual meeting, "that eight hours shall constitute legal day's labor from and after May 1, 1886." On the appointed date, unions and radical groups orchestrated strikes and large-scale demonstrations in cities across the country. More than 500,000 workers went on strike or marched in solidarity and many more people protested in the streets. In Chicago, a labor stronghold, at least 30,000 workers struck. Rallies and parades across the city more than doubled that number, and the May 1 demonstrations continued for several days. The protests were mostly nonviolent, but they included skirmishes with strikebreakers, company-hired thugs and police. On May 3, at a rally outside the McCormick Harvesting Machine Company factory, police fired on the crowd, killing at least two workers. The next day, at a rally at Haymarket Square to protest the shootings, police moved in to clear the crowd. Someone threw a bomb at the police, killing at least one officer. Another seven policemen were killed during the ensuing riot, and police gunfire killed at least four protesters and injured many others. After a controversial investigation, seven anarchists were sentenced to death for murder, while another was sentenced to 15 years in prison. The anarchists won global notoriety, being seen as martyrs by many radicals and reformers, who viewed the trial and executions as politically motivated. Within a few years, unions and radical groups around the world had established May Day as an international holiday to commemorate the Haymarket martyrs and continue the struggle for the eight-hour day, workers' rights and social justice. In the United States, however, the burgeoning Knights of Labor, uneasy with May Day's connection to anarchists and other radicals, adopted another day to celebrate workers' rights. In 1887, Oregon was the first state to make Labor Day an official holiday, celebrated in September. Other states soon followed. Unions sponsored parades to celebrate Labor Day, but such one-day festivities didn't make corporations any more willing to grant workers decent conditions. To make their voices heard, workers had to resort to massive strikes, typically put down with brutal violence by government troops. In 1894, the American Railway Union, led by Eugene Debs, went on strike against the Pullman Palace Car Company to demand lower rents (Pullman was a company town that owned its employees' homes) and higher pay following huge layoffs and wage cuts. In solidarity with the Pullman workers, railroad workers across the country boycotted the trains with Pullman cars, paralyzing the nation's economy as well as its mail service. President Grover Cleveland declared the strike a federal crime and called out 12,000 soldiers to break the strike. They crushed the walkout and killed at least two protesters. Six days later, Cleveland -- facing worker protests for his repression of the Pullman strikers -- signed a bill creating Labor Day as an official national holiday in September. He hoped that giving the working class a day off to celebrate one Monday a year might pacify them. For most of the 20th century, Labor Day was reserved for festive parades, picnics and speeches sponsored by unions in major cities. But contrary to what President Cleveland had hoped, American workers, their families and allies, found other occasions to mobilize for better working conditions and a more humane society. America witnessed massive strike waves throughout the century, including militant general strikes and occupations in 1919 (including a general strike in Seattle), during the Depression (the 1934 San Francisco general strike, led by the longshoremen's union; a strike of about 400,000 textile workers that same year; and militant sit-down strikes by autoworkers in Flint, Michigan, women workers at Woolworth's department stores in New York, aviation workers in Los Angeles and others in 1937) and 1946 (which witnessed the largest strike wave in U.S. history, triggered by pent-up demands following World War II). The feminist, civil rights, environmental and gay rights movements drew important lessons from these labor tactics. 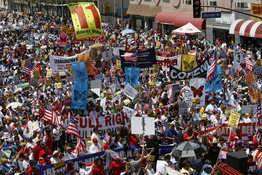 In 2001, however, unions and immigrant rights groups in Los Angeles resurrected May Day as an occasion for protest. The first few years saw rallies with several hundred participants, but in 2006 the numbers skyrocketed. That year, millions of people in over 100 cities -- including more than a million in Los Angeles, 200,000 in New York and 300,000 in Chicago -- participated in May Day demonstrations. The huge turnout was catalyzed by a bill, sponsored by Representative James Sensenbrenner Jr. (R-Wisconsin) and passed by the House the previous December, that would have classified as a felon anyone who helped undocumented immigrants enter or remain in the United States. In many cities, the protest, which organizers termed the "Great American Boycott," triggered walkouts by high school students and shut down businesses that depended on immigrant workers. Since then, immigrant workers and their allies have adopted May Day as an occasion for protest. America is now in the midst of a new Gilded Age with a new group of corporate Robber Barons, many of them operating on a global scale. The top of the income scale has the biggest concentration of income and wealth since 1928. Several decades of corporate-backed assaults on unions have left only seven percent of private sector employees with union cards. More than half of America's 15 million union members now work for government (representing 37 percent of all government employees), so business groups and conservative politicians have targeted public sector unions for destruction. Attacks during the past few years on teachers, cops, firefighters, human service workers and other public sector workers -- in Wisconsin, Ohio, Michigan and elsewhere -- the most ferocious anti-union crusade in decades -- have catalyzed a tremendous sense of urgency among union workers and millions of other Americans who've seen their standard of living plummet while the richest Americans and big business plunder the economy. Tens of millions of American working families are suffering, with new waves of lay-offs and foreclosures, exacerbated by severe cutbacks to government services. But we've also seen a resurgence of activism among the ranks of low-wage workers. The past few years have seen an explosion of worker unrest, especially among Walmart employees, workers at fast-food chains, janitors, and hospital workers, demanding that employers pay them a living wage. In a growing number of cities, local elected officials are proposing local minimum wage laws. Los Angeles Mayor Eric Garcetti is backing a citywide minimum wage of $13.25 an hour by 2017, while almost half of LA's City Council supports a $15 an hour minimum wage. Democrats in Congress are now rallying behind the idea raising the federal minimum wage from $7.25 an hour to $12 an hour -- something that would have been unthinkable just a year or two ago. These dramatic changes in so short a time didn't happen by accident. They are a culmination of years of grassroots activism. Although May Day may not be an official holiday in the United States, it is nevertheless an important part of this country's tradition. This year's May Day rallies will continue that American tradition of dissent and protest for a more humane society.